This recipe appeared in the Winter 2008 issue of Texoma Living!. In a mixer bowl, stir together all dry ingredients. Grate butter over flour mixture and mix on low speed until butter is incorporated. In a small bowl, stir together the buttermilk, egg and vanilla. Add to the flour mixture and stir to combine. Add currants or raisins, if desired. With lightly floured hands, pat dough on lightly floured board to ½ inch thickness and cut into triangles. Place triangles on an un-greased baking sheet. 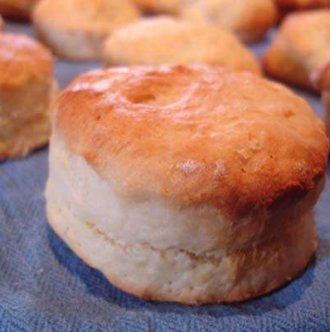 Bake for 10-15 minutes, or until the top is lightly browned and a cake tester or toothpick inserted into the center of a scone comes out clean. Let cool for 5 minutes. Serve warm. From The Dining Car published by the Denison Service League. Summer vacation is over. School has started. Nikki Bitzer is back in the classroom. Life is good, really good. For this Sherman teacher, nothing sounds so sweet as the bell signaling the start of another class.